Where are you ? Market is very active at the moment. Managed to grab a AU short. Up 55+ pips & a few pips away to hit my TP. I may change the TP based on the conditions. Have been on a meditation retreat since last week which has just ended today. I’ll be back with regular posting tomorrow and catching up on questions, but hope you’ve had a good trading week and look forward to seeing your trades and posting some of setups. Great to have you back , i had usd/cad this morning too for 36 pips. I always say " a win is a win ". Ha ha mate, Agree. But I had to change my mind due to Price Action behavior. So closed it manually. Good to see you back Chris expecting your view on current situation. Looks like EU in action after PPI result. More than 200+ pips move with in 02 hours. Unfortunately I didn’t grab any trade. 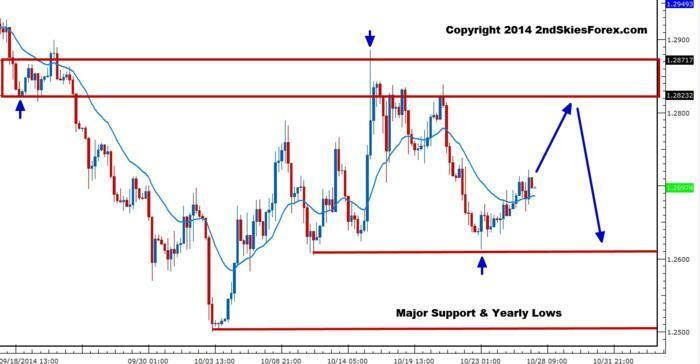 Flipping price action bias from short to long on the $EURUSD. Yeah looks like Bulls back in action. Waiting for you analysis Chris. Hope you had a good weekend. Just going to touch upon the USDCAD. As i’ve been discussing over the last few days with my members, the USDCAD was offering a potential [B]pullback entry[/B] around 1.1250. Minus the one [B]false break[/B] below it, that level has relatively held (for now). The pair had a corrective pullback into the level, which has held and since bounced, but the pair is only limping higher atm. Bulls will want to see a greater push/impulsivity soon to stamp out any bearish ideas. If the bears come in heavy, the bulls will likely fold below the low from the 17th, and a deeper pullback will likely ensue. For now, anyone long will keep the targets the same. Good trading tomorrow to y’all. Being one of the stronger indices over the last few days, the Nikkei was offering a great false break setup at a clear level (~14791). As you can see from the chart below, the bids held here cleanly, sending the Japanese index +270 points higher. 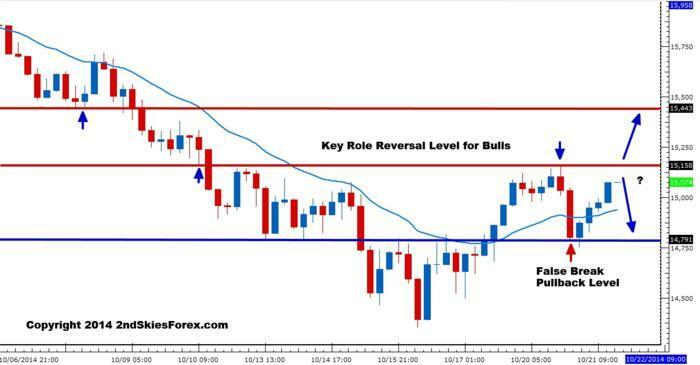 Role reversal levels after a false break can often be a great trade location as we’ve discussed in our false break setup article. For now, bulls have a solid challenge around 15150 where some bears may look to sell. If this holds, then a trip back down towards 14790/14800 seems in order, but if this breaks, then the next resistance up isn’t till around 15445. CAD gaining heavily vs. USD. TP hit with 30+ pips. Looks like Cable bullish at the moment. Maintaining its corrective bounce off the 1.2612 support, the Euro has sauntered along rather steadily, but without impulsiveness. I’m guessing this rally will be sold aggressively, so traders can look towards near term resistance to get short (barring any massive upside moves). There is a nice support zone between 1.2821 and 1.2871 which I’m guessing sellers will be parked at. Only a daily close above 1.29 will really change the ST bias from bearish to bullish. A break below 1.26 aims for the big figure at 1.25. Hope you enjoyed this and look forward to your comments and feedback. For the last several days, the Nikkei hasn’t joined the US index party as its been consolidating near a resistance level while the US counter-parts have been high-flyin’. One thing that has emerged is a pre-breakout structure on the Japanese index right below a key role reversal level at 15446. Notice the 20 EMA carry and weak rejections off the resistance. 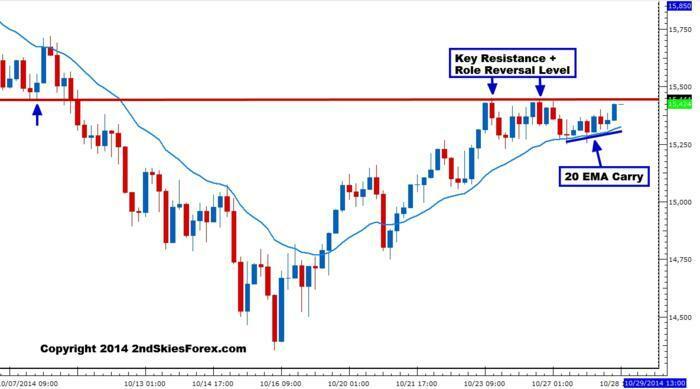 Traders should watch for a breakout trade here, potentially within the next day. If the level folds, the next upside resistance is around 15725 and 15825, so plenty of upside available. Thanks for the analysis Chris. Had some pips from the bull run. At the moment no EU trade for me.Very thin market. Looking at the levels you have mentioned here. 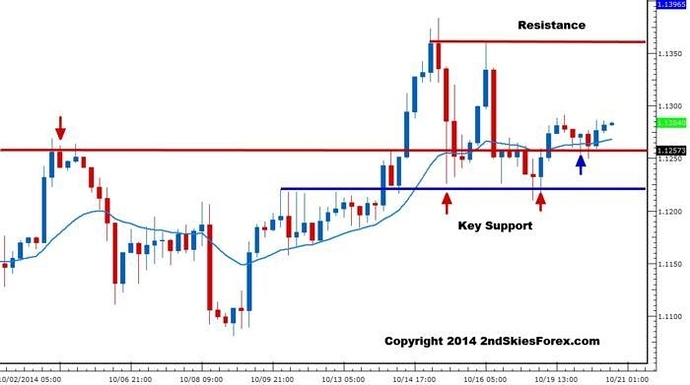 BTW came across a nice trading video done by you on trading a false break setup + Key Support level.